– The opening video took us back to last week when Dean Ambrose and a Referee shirt caused havoc for WWE World Heavyweight Champion AJ Styles, who looked for an “easy night” as he gave James Ellsworth a “chance at a Title opportunity.” Sure enough, as Ambrose was still irate with Styles’ cheap tactics, he gave him his own medicine as he deliberately screwed him over multiple times to allow Ellsworth to beat him. That brought us to the real main event WWE World Heavyweight Championship match where Styles would defend against Ellsworth. – The backstage segment with Ellsworth and Ambrose was a nice start, as we seen a nervous Ellsworth greeted by Ambrose, who held an actual Ellsworth t-shirt that was available on WWE Shop now. It was the meme face. God help us, that’s probably a best seller by now. – This Randy Orton-Bray Wyatt feud continues to sink, even with Kane’s involvement and Luke Harper’s return. Anyways, the Orton-Harper match took place after a meh promo from Orton where he claimed that he “lost his sanity” that Wyatt answered in the foggy big screen as he laid in a coffin with black sheep all around him. You can’t make this stuff up. The match wasn’t even long, as Orton hit a superplex on Harper and the sounder went off, as we saw Wyatt make his “Firefly” entrance while held in the coffin by his disciples or whatever. Not long after, Orton went for the middle rope DDT when Wyatt attacked him to cause the DQ. The “twist” here was Kane coming out of the coffin (which we guess explains his disappearance) as the faces battled back. Orton went for an RKO before the lights went out and the heels vanished. This is all too hokey for us. God help us if a casket match is the next phase. They don’t just bring these things out now without further use. – The backstage promo from Styles was a logical mix of confusion and confidence as he couldn’t believe the main event. He spoke of his “scratch and claw” work ethic to get to WWE all for naught now that he had to defend against “wet noodles” like Ellsworth. He feared shenanigans from Ambrose and didn’t want to think of the upset it could cause, as he compared it to David Arquette’s reign as WCW World Champion. He warned Ambrose he’d find him if he was cost the Title. – With Alexa Bliss on a downslide after a loss to Naomi at No Mercy, she was eager to get back on the “W” side as her Nov. 8 Title shot approaches. Only Naomi’s entrance was televised, but we dug Bliss’ Freddy Kruger-inspired attire. This was a better match, as they mixed Naomi’s athleticism with Bliss’ submission-heavy offense. It was decisive towards the end as she knocked Naomi off the top rope and hit Twisted Bliss to get the pin. Her post-match promo hyped the Nov. 8 match and she promised the “fairy tale would end.” Little did we know that was in three weeks. – We were ready for Curt Hawkins’ in-ring debut, but were skeptical when it was revealed that Apollo Crews was his opponent. That either meant that Crews fell off the edge, or this wouldn’t happen at all. The latter was his it went down, as Hawkins came out with his cane and voiceover narrator and told bad jokes. He took offense when Crews slapped him across the face and refused to wrestle. It got some nice heat in the moment, but what exactly is the plan for Hawkins? Is he a chicken heel? – The in-ring segment with Carmella and Nikki Bella was a nice advancement of their feud, without physicality believe it or not. It was a pure war of words, as we saw Carmella promise to “expose” Bella and Bella came down to the ring to hear her say it to her face. Anyways, the subject matter was a little disappointing, as they had Carmella accuse Bella of being a needy wife to John Cena and using her sister, husband and looks to get where she was. Bella on the other hand, had a nice retort as she got over that she worked hard to come back from a career-threatening injury and chose to focus on athletics in the ring than her personal life. Carmella got the last word though, as she threw around a “gold digger” insult. They made the feud a bit more personal and we actually want to see Carmella get hers. Will Cena somehow get involved? 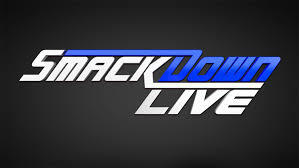 – The backstage promo from Ellsworth was more main event hype as he spoke of his trembling hand but that he survived Styles in the ring, got to be on “Talking Smack,” and his life would change because he said he could tell his grandkids he was in the ring and competed for the World Title on SD Live. Classic Ellsworth stuff. At least his promo skills are decent. – The Six-Man Tag between WWE SmackDown Tag Team Champions Heath Slater/Rhyno/WWE Intercontinental Champion Dolph Ziggler and The Miz/The Spirit Squad was a good continuation of the Miz-Ziggler feud, while they threw in the SS to quarrel with the Tag Champs. We got a pre-taped promo from Slater/Rhyno who said they helped out Ziggler last week because Slater wanted to be a role model and Rhyno hated male cheerleaders. Funny. The actual match itself was nice, but memorable more towards the end. Slater got a big pop for the hot tag and Rhyno’s Gore also went over well, but we liked the finish. Miz slapped Slater from outside the ring, which allowed Kenny to scoop him up in a pin. Above all else, it gives SS an excuse to challenge the Tag Champs. Will we see that on a future episode? – The backstage segment with SmackDown Live General Manager Daniel Bryan and Natalya seemed to be more about Natalya’s cat obsession and Whitney Houston lyrics than anything serious. She suggested being the first member of the SD Live Women’s Team, while Bryan asked her what made her worthy. – The Baron Corbin-Jack Swagger match was a complete 180 from what we’ve recently seen from the two. Corbin got a pre-taped promo where he said he’d make Swagger pay for having fun at his expense as well as the people who chanted “We The People.” They took the most crowd-involved aspect of their feud and put it front and center. Better yet, this was a short match, as Corbin dominated Swagger and put him down with the End Of Days. A pleasant surprise of a manhandling. What’s next for both men? – The backstage segment with Natalya, Bryan and Ambrose saw Natalya still showing Bryan cat pictures when Ambrose showed up in a Referee shirt as he thought he had the gig again. Bryan couldn’t allow it in a World Title match, but offered him any of the Ring Announcer, Timekeeper or Commentary gigs. Ambrose said he’d “do that” as he didn’t say which one, which confused Bryan, yet made us a little more interested in the main event. – The WWE World Heavyweight Championship match between Champion Styles and Ellsworth continued the theme of Ambrose trying to get inside Styles’ head, while Ellsworth gets a rub from it. Ambrose entertains in this role, as he was Ring Announcer and praised Ellsworth as “Rocky II, III and IV all wrapped into one” and insulted Styles as the “Current and temporary World Champ.” Ellsworth got big crowd chants, so perhaps they were onto something. Ambrose also played timekeeper, as he purposely rang the bell 100 times. Ambrose continued to taunt Styles as he broke in on the mic to plug WWE programs, Ellsworth’s shirt, Verizon Wireless and also made public service announcements about commercial breaks and cars in the parking lot. Styles grew more enraged as the match went on, as Ambrose kept it on. At one point, Styles and Ambrose threw Ellsworth in and out of the ring at one another. Styles pointed at Ambrose from the top rope, which set up Ellsworth to knock him onto the post and he hit a stiff superkick for the world’s greatest near-fall. The crowd was so into it that even we wished for the three. As things rolled on, we wondered why Styles wouldn’t just disqualify himself to get out of the match. Sure enough, Styles got himself DQ’d when he attacked past the five count. Of course, that set up another Title match since it meant Ellsworth technically got the win, yet Styles kept the Title. Styles went to attack Ambrose and got laid out with Dirty Deeds. This was entertaining as always with these three, but we don’t like that the World Title has sort of become a punchline. Hopefully, Styles rebounds next week and looks strong. Posted on December 10, 2016, in WWE and tagged AJ Styles, Alexa Bliss, Apollo Crews, Baron Corbin, Bray Wyatt, Carmella, Curt Hawkins, Daniel Bryan, David Otunga, Dean Ambrose, Dolph Ziggler, Heath Slater, Jack Swagger, James Ellsworth, JBL, Luke Harper, Maryse, Mauro Ranallo, Naomi, Natalya, Nikki Bella, Randy Orton, Rhyno, Survivor Series, The Miz, The Spirit Squad. Bookmark the permalink. Leave a comment.